FC Barcelona striker Luis Suarez, who was appointed by Tourism Malaysia as its ambassador last year, has wished a happy Chinese New Year, but with vanakkam (hello in Tamil) and Batu Caves as the background. "Other than celebrating and experiencing different cultures in Malaysia, I'm also learning some basic Malaysian words. "Happy Chinese New Year everyone. Malaysia is a country that celebrates its diversity," tweeted Suarez, together with a link to a Tourism Malaysia video. A Twitter user said while the tweet would have been like any other Chinese New Year greeting, it would have been more appropriate if Suarez had posted a still from the video saying ni hao (hello in Mandarin) for the accompanying tweet. 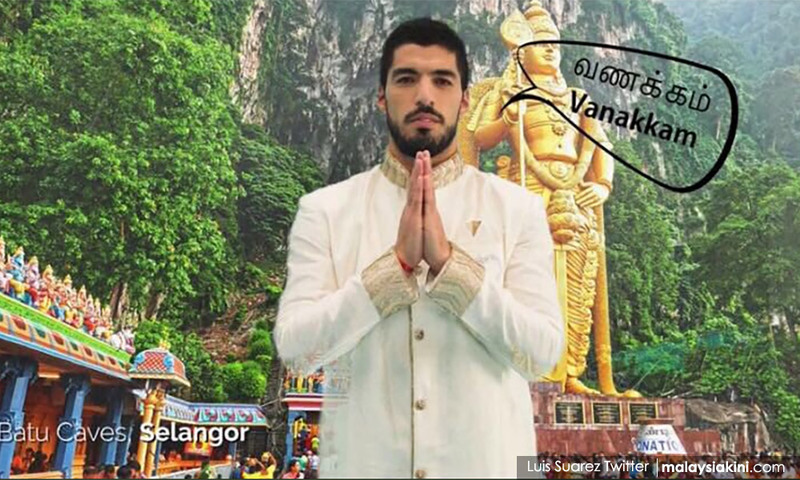 In the 19-second video, Suarez says hello and welcome in Bahasa Malaysia, Mandarin and Tamil, dressed in the respective traditional outfits. Tourism and Culture Minister Nazri Abdul Aziz had previously defended the decision to appoint Suarez as an ambassador for Tourism Malaysia. Known for his "biting" antics on the football pitch, Nazri had said that Suarez should not be punished over what happened in the past. Through cooperation with FC Barcelona, the Tourism Malaysia advertisements will be screened at 18 stadiums during La Liga matches. Nazri also said the government spent a total RM7.5 million for the whole campaign, which included RM4.4 million on advertisements. "RM3.1 million was paid for the costs of the four videos with a 60-second duration each, featuring Suarez promoting tourism destinations, culture, food and traditional sports in Malaysia via his social media," he had said. This means that the striker was paid up to RM775,000 for each advertisement.